Today I walk the pace of an 83-year-old man. I’ve watched him 50 yards ahead of me for the past hour or so. When he goes up a hill in the distance, I can see that I’m not catching up. Later when I am on a rise looking down, I see him below me. He stays the same size. If he were getting smaller, I would know he’s pulling away. If he were getting larger that would indicate that I was walking faster than him. This man and I have met up three or four times over the past 10 days to exchange greetings and some pleasantries. We follow the ancient pilgrimage route of the Via Podensis from Le Puy, France, towards the west and Santiago, Spain. Via Podensis is just one of hundreds of paths that form a spider’s web throughout Europe, Scandinavia and the Middle East that connects the three most popular pilgrim destinations of the Middle Ages: Jerusalem, Rome and Santiago. Today people like the man ahead of me continue to follow these ancient routes. Earlier this morning, the 83-year-old man recognized me and my two traveling companions. “Ah, Le Trois — the three are still together,” he said in French and smiled approvingly. We all know each others’ countries of origin — me, USA; Michel, France; Joseph, Belgium; and the 83-year-old man, Switzerland. This man from Geneva is an intriguing loner, so we haven’t wanted to get too close too fast. He has ducked out of every conversation so far without leaving his name behind. Indeed, in one meeting when asked where he planned to sleep for the night, he answered before disappearing, “A kilometer away from nowhere.” In other words, off the beaten path of the popular pilgrim sleeping spots. But today we finally exchange names. Jean-Francois is fit and trim, dressed in ultra-modern, lightweight backpacking attire and equipment. He carries a smile along with a tall wooden hiking pole intricately carved with the names and corresponding years of each Camino he’s walked. Jerusalem in 2014. Lourdes in 2015. Arles and other pilgrimages routes across Europe dated with the carver’s flourish. The 83-year-old man has walked over 60,000 kilometers in the past decade or so. And so now, I am still not catching up. Interestingly, Jean-Francois typically appears at a crossroads or a church. The next time I see him, he’s standing at a crossroad to warn us not to go in the wrong direction. He comes along side of me and we walk for awhile together. He does not speak much English, and I do not speak much French, but we talk in simple words and communicate well. I tell him that I, too walked Lourdes in 2015 and Arles in 2008. When he looks down at my hiking boots matching the rhythm of his and says, “Vous marchez bien!” or “You walk well, ” I feel like I have been honored with the best compliment. For today I am proud to walk the pace of an 83-year-old man. Stacey “Vagabonding Lulu” Wittig is a spiritual travel writer based near Flagstaff and Sedona, Arizona. This article first appeared in Pinewood News in May 2016. 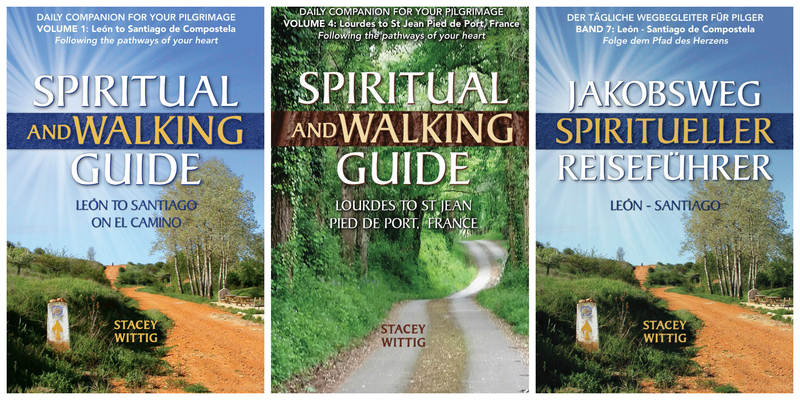 She wrote from the road that month while traveling Les Chemin de St Jacques – Via Podiensis – in France.